Border Crossings had been a bit of a worry on the Mongol Rally. Up until our Russian entry we didn’t have the proper paperwork for our car. As some of you may know, our V5 (proof of ownership) for our car didn’t arrive in the mail. 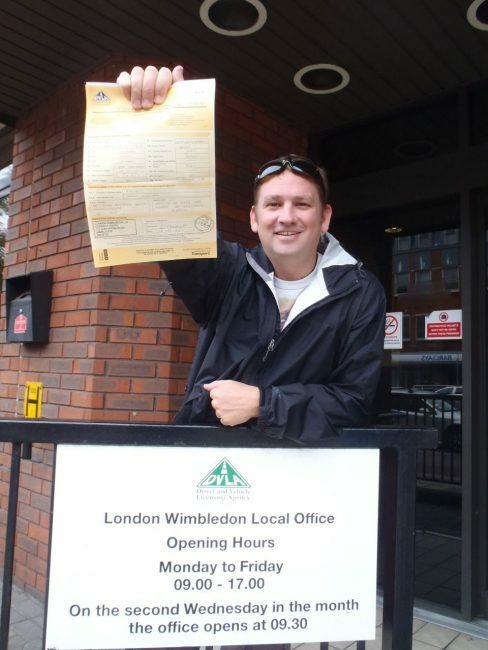 Allways rentals, a campervan rental company in New Zealand sponsored our car in England and because neither of us lived in the country, we had difficulty getting the paperwork sorted out. For reasons beyond their control, the seller of the car didn’t send in the transfer of ownership to the DVLA (licensing office) in England. We arrived to London a week early to get the problems sorted out, but only managed to get a temporary V5. 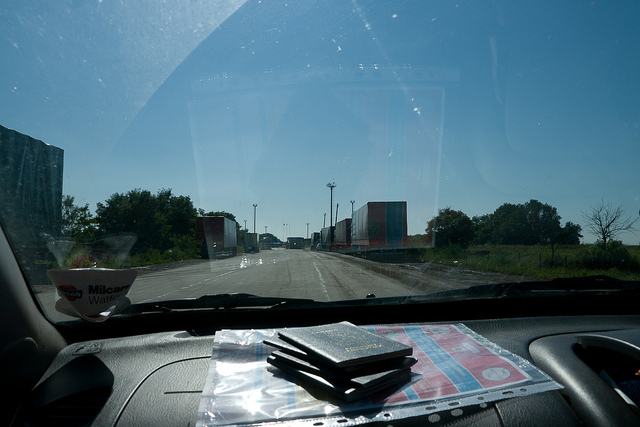 As we passed through borders, guards commented that this was not the proper documents and that we could not pass. We had to do a lot of fast talking and slow waiting to eventually have them allow us through, so when we got to Kiev and had our London contact email us our actual official V5 documents, we knew that life was going to be easier. We arrived extra early to pass through the border hoping that morning would be a better time for us to go through. 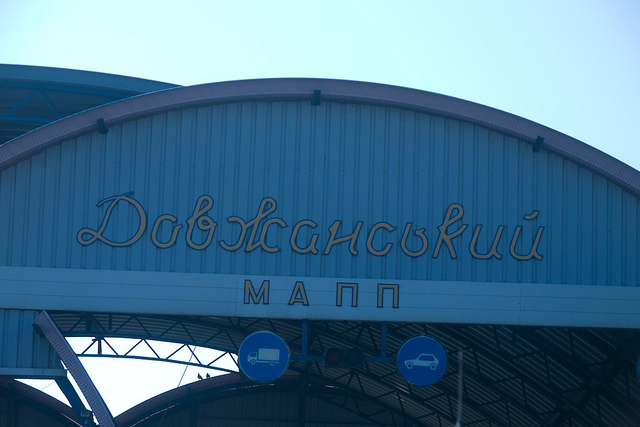 Leaving the Ukraine was painless if not time consuming and the moment of truth came when we had to enter Russia. Dave is the owner of the car, so he has to do all the dirty work. He goes up to the window with papers in hand as the officers look everything over. The usual questions are asked. We assume that vehicle passport means ownership so we hand them our V5 and our insurance papers. Dave repeats over and over with each question and demand. This is all I have and offers up nothing more. “Wait 5 Minutes” the guard says. Dave comes back to the car where Sherry Rick and I are waiting. We are doing everything that one normally cannot do at a border crossing. We’re snapping photographs, we’re sending twitter and facebook updates from our iPhones, we’re cleaning out the garbage from our car and throwing it in their trash cans and we’re standing outside stretching and relaxing. Nobody seems to take notice. The guard is perplexed as to what to do next. Normally people offer up something more and talk themselves into paying a bribe or a fine. He barks, come back 5 minutes. Dave returns to the car and waits the standard 5 minutes. 5 minutes seems to be the favourite saying of border guards even thought they can make you wait up to a half an hour in that 5 minute span of time. Dave walks back and is asked one last time. Then the ordeal is over, just like that. He hands Dave back the papers and his passport and we pass through to Russia. We have entered with ease and no bribes were paid. We then celebrate the fact that we made it through the Ukraine without paying a single bribe or being stopped once by the police. It’s a country notoriously known for it’s police corruption and we were prepared to pay our way out of more than one police check point. We made it through unscathed however, and we hope that this is a sign of things to come for the rest of the rally. Smooth sailing is just the way we like it! 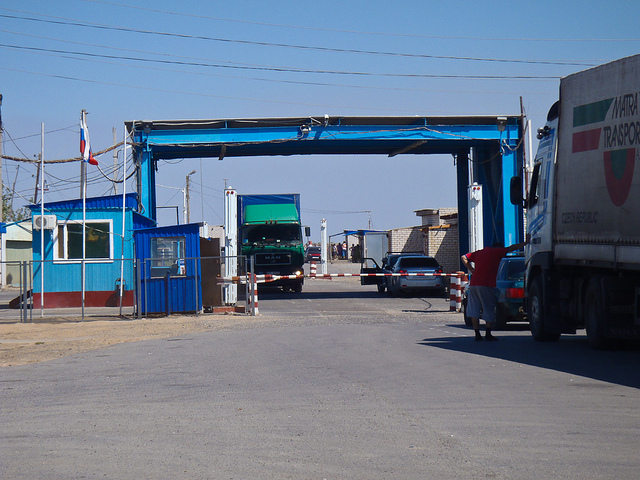 9 Responses to "Now that’s how you cross a border"
I used to travel through Tashkent Uzbekistan on a semi regular basis. The Customs, Immigration and Police at the airport were notorious for just plain taking things. You had to watch them like a hawk. After I told a friend he gave me the solution. Next time through I had 2-3 small flashlights, the kind that sell for $2.00 in the states. I packed them on top and when the guards started going through the luggage they picked it up started looking at it. I told the you like it? It’s a present, yours to keep. Immediately my bags were closed and I was wished a good flight. Saved lots of hassle. I knew guys that wound up missing cameras, dvd players and all sorts of high end stuff there. That is a great idea. 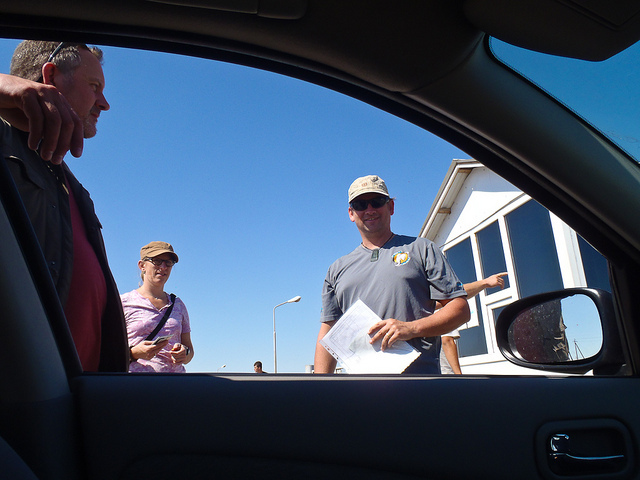 We actually noticed at every border crossing that the guards were hinting that they wanted something from us. We gave them batteries once. The wanted our walkie talkies once too, but we didn’t give it to them. Sherry and I came to the conclusion that we had less hassles than others because there were two women in the car. Whenever we got out to have a look at what they guys were talking about, the guards backed down. Good tips for others crossing borders during future Mongol Rallies for sure. Thanks! More so than making it all the way to Mongolia, the feat of making it through without paying bribes is an accomplishment! Smooth sailing = safe but it also isn’t as interesting as having to struggle through real challenges. Having to bribe your way past an official would have made a far more interesting story and memorable experience don’t you think? Isnt that part of what the rally is about- working your way through unideal situations. Still, glad you guys made it safely! Good on ya! Border crossings make me twitchy and in a corrupt country- mental sweat dripping as I write. You must be charmed to have made it through that one sans bribe. “When we crossed middle eastern boarders we had to bribe with a big case of cigarettes!” Wow, that sounds exciting and frightening at the same time! Dave and Deb, you must be happy things are going much smoother for you. Hope the rest of your journey goes as trouble free as the first half! Nailuchshie pozhelaniya (Good luck)!